In which a recruit’s name is plugged into Google and the bits of information that trickle out–guru ratings, newspaper profiles, YouTube highlights, all that stuff–are synthesized in the hopes of getting a clearer picture of the player we’ll see at Auburn next fall. Previously: Jessel Curry, Craig Sanders, Roszell Gayden, Brandon Mosley, Demetruce McNeal, Jake Holland, Shaun Kitchens, Cody Parkey, Cameron Newton, Joel Bonomolo, LaDarius Owens, Antonio Goodwin, and Kenneth Carter. Yes, this is two of these in two days, because have you seen how many I’ve still got to do before the season starts? Sometimes, there’s just not that much to say about a recruit’s recruitment process. Last December, Ryan White was looking to head to South Carolina, maybe Georgia Tech, maybe Southern Miss. Then Auburn offered. Then he took a visit. And then he committed. The entire thing took a matter of days. 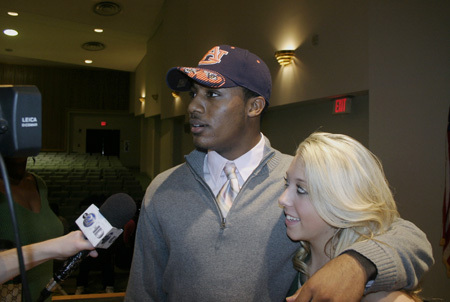 But it is worth noting this: when White committed, there were still several high-profile cornerback recruits on the board, many of which had been connected to Auburn in some fashion. But it was White who allegedly became Chizik and Co.’s top priority at the position–explaining why he wound up going from the 0 of unoffered to the 60 of committed so quickly. HIGH SCHOOL: Named to the All-Southeast Region team by PrepStar … Played quarterback at Lincoln … Led Lincoln to a 9-4 season and 11th consecutive district championship in 2009 before falling in the playoffs 45-31 to top-ranked Niceville … As a junior, had 640 rushing yards on 115 attempts including six touchdowns, and completed 76-of-161 passes for 1,063 yards while throwing 14 TDs … Also excels on the track and field team. Not sure why White’s senior stats aren’t listed, but according to Scout he did rack up more than 2,200 total yards in his final year at Lincoln. Which, for what it’s worth, is one of Tallahassee’s most consistent producers of college talent. The other thing worth noting is that–if you couldn’t tell by the photo, or forgot after the commitment articles–White was a high school QB and will have to make the adjustment to playing full-time corner. We have White listed in the athlete category but if he lands in a spread zone-read or option type of offense we feel he could be productive as a quarterback … Is long, rangy and silky smooth. 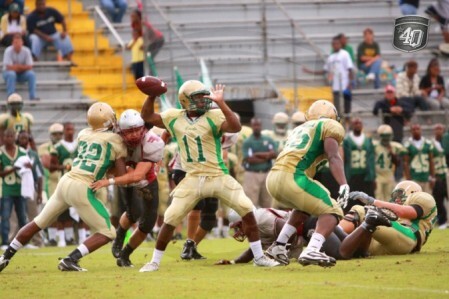 Does a great job moving around the pocket and changing his launch points … Very dangerous with the ball in his hands. Excels at improvising out of the pocket when the original play breaks down. Throws well on the run with touch and is very effective tucking it to run. Flashes very good elusiveness in space with fluid hips and sharp cutting/change-of-direction skill. Displays good foot-quickness and reaches top speed within his second or third step. Shows good acceleration through the second level and long-speed; a smooth, natural runner … More efficient as a dink and dunk underneath passer. That said he is a natural athlete and looks smooth even in his footwork from under center and as a total ball handler. White has the tools to polish as a zone-read, spread quarterback or could be effective in a change-of-pace type role in a Wildcat formation while splitting time at another skill position (likely DB or WR). Good prospect. So even here they’re not really evaluating him as a corner, but at least they acknowledge his athleticism–and his corner-friendly acceleration and smoothness of motion. Also in ESPN’s favor is Smith’s offer sheet, which isn’t eye-popping but isn’t commensurate with his Rivals/Scout assessments, either: South Carolina, Oregon, Arkansas, Georgia Tech, Ole Miss, Illinois. That ain’t chopped liver, there. What position do you expect to play at Auburn? Right now it is a tossup between quarterback and corner. Wherever I fit best is where I’m going to play. Also kick returns, I’m going to try everything. I want to see where I can fit best to contribute to the team. I love that for some reason. Not sure why it wasn’t mentioned in the bio above, but White made the Florida 4A All-State second team as an athlete. Since this is Florida we’re talking about, that’s kind of saying something. Following a first half where he was 1 of 6 for 18 yards and two interceptions, Lincoln’s Evan Brigman — the Big Bend’s leading passer — was replaced with fellow senior Ryan White. White, who is more of a running threat than Brigman, was given a run-pass option on most plays. Lincoln offensive coordinator Mike Zatoris put his quarterback on the edge to stymie the Rickards defense, which was blitzing up the middle. White completed 63 percent of his passes (7 of 11) for 92 yards and added 123 rushing yards. So, uh, why didn’t he start? There’s not much else out there I can find on White. He planned an official visit to South Carolina and his dad played for Steve Spurrier. That’s about all I’ve got. WHAT CONCLUSIONS WE CAN DRAW, IF ANY: I said when White committed that I didn’t think the gurus had a good bead on White’s potential as a cornerback, and I still don’t. He’s going to play a position where they’ve never seen him play; he’s got offers that don’t seem to jibe with his ratings; and as always, being short, fast, and slippery isn’t enough for them when compared to tall, fast, and maybe less agile. I don’t think White is destined to enter the rotation at corner right away, and it might be a couple of seasons before he gets a legitimate chance to start. But if he’s as slick an athlete as the interest from Auburn’s coaches, the 4.4. speed, and other boatload of offers suggest, he should find himself on the field in special teams sooner rather than later, and could eventually make a big difference in the defensive backfield. I love chiziks philosophy in going for qbs to change to dbs that’s how he did it before when he was here and also how muschamp did it makes for smart quick thiinking corners. Me too, Josh. Those guys are almost always playing QB because they’re the best skill-position athletes on their teams. An “undersized jitterbug athlete type”. Something about that picture instantly reminded me of another QB with a last name of White that Auburn got pretty familiar with a couple years ago in Morgantown. Dare to dream?